The transistion has started. I'm slowly making my way from my AOL blog, where things are not always as they seem, to this marvelous place! Welcome to all who stumble in here! I've always been opinionated, you see. 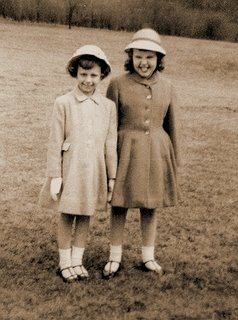 The evidence: This Easter morning photo of my late sister, Carol, and me (circa 1958). Guess which stunning babe is me.